Analysis: Given the impending Senate hearings on Denny Blair’s confirmation and the expected smooth sailing, most people I know were mildly surprised that McConnell jumped ship today, rather than waiting for a formal turnover to a confirmed Blair. McConnell has had a solid, successful track record of leading the IC in an era of long-needed reform, while contributing to a track record in his tenure of zero terrorist attacks on American soil. 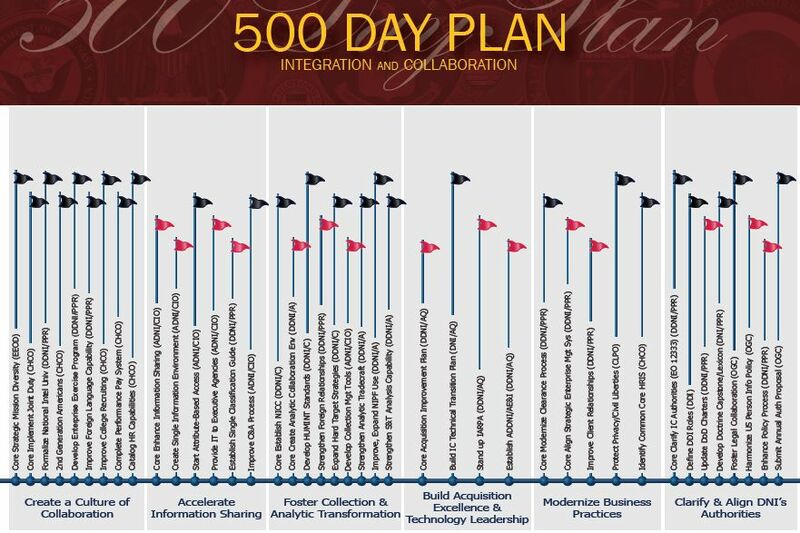 But then my inbox pinged with another notice from the Office of the DNI: release of “The 500-Day-Plan Update at Day 400” (download the PDF version here). It contained a graphic depiction of the troubling challenges remaining – actually using graphic “red flags” to mark areas at risk. More on the flags below. Has it worked? Independent assessments have been largely absent – but judging from my email inbox over the past year there have been mounting frustrations among IC personnel at entry, middle, and senior levels. A look at the accompanying chart shows starkly that much of the most vital work laid out for the Plan is “at risk,” to use the report’s own term. Study page two of the report: the red flags flutter across the page marking areas in danger of failure. Several of the risk areas may be explicable in prosaic ways common to Washington. For example, I’m led to believe that IARPA is at risk because of funding and other bureaucratic factors. But seven years after the 9/11 attacks, and half a decade after the 9/11 and WMD Commissions which prompted formation of the DNI and his staff, we still grade the fundamental task to “Enhance Information Sharing” at risk of failure? DNI McConnell leaves office with an honorable reputation, and with the satisfaction that the IC has led in foiling a number of serious plots against the national security of the American homeland. But in his farewell letter to IC employees, he highlighted as top achievements passage of an updated FISA surveillance law, and clarification of the aligned responsibilities of the 16 intelligence agencies. “‘These documents lay a foundation to provide the IC the structure and tools needed to continue our work, while expanding privacy and civil liberties protections to all Americans,” McConnell wrote, according to the AP account. Those are the type of simmering, long-payoff measures of success that would sound appropriate in a time of peace, calm, and low demands on the nation’s intelligence services. In a time of war and grave international uncertainty, I believe intelligence veterans – Mike McConnell among them – wish he could claim more. I find it strange that they released this 400 day report now. Especially given that day 500 was something in the neighborhood of 6 weeks ago. I’ve seen the full post-500 day report and hopefully they’ll get that up soon. I’m not going to claim it’s a rousing success, but FWIW, 39 of the 42 initiatives were deemed as a success. The methodology of the report was to deem anything open that crossed 400 days at risk; ie a-space was deemed “at risk”, even though it rolled out the same month as day 400. Hi Justin – I’m aware of the internally released day-500 report, but I try as a rule only to blog about publicly available info. Even so, you and I both know that the methodology is sub-optimal, to put it mildly. Reassurance to leadership and the outside world is less valuable than a frank assessment of progress vs failure. I think the Integrated Information Plan discussed in this WSJ article has a good chance. The technology has improved a lot since these kinds of efforts were first started. Jack, you’re right on the new plan (I’ve done a little advice on it) and I’m hopeful. But that’s the tech side of the equation; most of the problems, roadblocks, delays, and mistakes come on the managerial and execution fronts. Quite simply, lack of leadership and no penalties to poor performance. You’re absolutely right about that. We’ll have to see how the new DNI acts on this. There appears to be more buy-in from agencies at the exec level, and they not only have a technology pillar, but also systems engineering, program management and business process transformation. It’s still a lot to bring together, but I’m hopeful. I am hopeful as well, always am – I’m a crazy optimist! – and I’m also hoping that Mike McConnell will use his new “grey eminence” position at Booz to opine and counsel on what REALLY needs to be fixed in ODNI and the full IC. Negroponte was unable to do so because he moved immediately back into his State Dept position, or perhaps he has just been unwilling to speak out. But McConnell could and should share his unmatched view of what obstructs IC reform.